An equine dentist floating a horse's teeth. Horses start out with temporary baby teeth and, by the age of five, usually have a full set of permanent teeth. The front teeth cut hay and grass, while the cheek teeth grind the forage in a sideways motion, breaking the food into a pulp that is easy to swallow. Unlike some animals that can digest their food with little breakdown by chewing, horses must chew their food sufficiently for it to digest properly. If the horse's teeth don't have a flat surface that can grind the food, the digestive process is hindered. A horse's teeth continue to grow throughout their lifetime. You can prevent expensive veterinarian bills by routinely having your horse's teeth checked. A mature horse has up to 44 permanent teeth, which keep growing until they are up to 30 years old. Horses that forage for much of their food and eat plenty of grass often need less work on their teeth than horses that eat regular hay because not only do the fibers of heavier grasses require more grinding with the teeth, but they also contain silica, which is abrasive, and helps keep the teeth worn down. Since the horse's teeth continue to grow for most of its adult life, and because the upper and lower jaws may be of unequal widths, a malocclusion, with abnormal or incorrect contact between the teeth of the upper and lower jaws, may make normal chewing and grinding difficult or impossible. Typically, horses chew on their metal bits and on nonfood items, such as wood, stone, trees, and plastic. This activity often damages the teeth or causes them to grow unevenly, resulting in sharp points, edges, and spurs that can injure the horse's mouth and make chewing painful. Points and sharp edges develop on the upper cheek teeth toward the outside of the mouth and on the bottom cheek teeth toward the inside of the mouth. These points then cut into the cheeks and tongue of the horse. Once points, spurs, and sharp edges begin to create discomfort, the horse will attempt to relieve the pain by chewing unnaturally in an attempt to grind the food. As the horse attempts to compensate for the painful, uneven teeth, the problem becomes worse, and teeth can be worked loose and jaw problems may develop. Floating the horse's teeth on a regular basis helps prevent the problems related to uneven or problem teeth and the effect they have on the horse's health and vitality. How is horse dental floating done? Typically, the veterinarian or horse dentist may sedate your horse, not to relieve any actual pain since your horse doesn't have any nerves at the surface of the tooth where floating is performed, but to relieve the horse's anxiety and make the process easier. A special halter will be used with a rope attached to a beam to hold the horse's head up during the procedure. 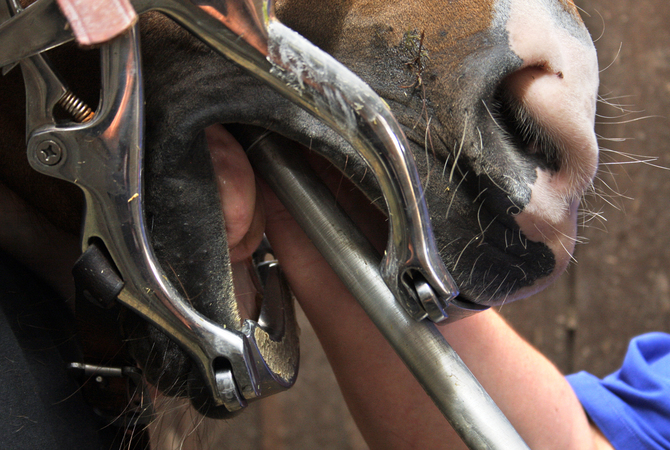 A mouth speculum will be inserted to keep the horse's mouth open. A special rasp is then used to rasp off excess tooth material to create a level surface so the molars can come together with proper movement of the jaw. The teeth will not be completely flat or smooth because some irregularity is needed for the horse to grind food. 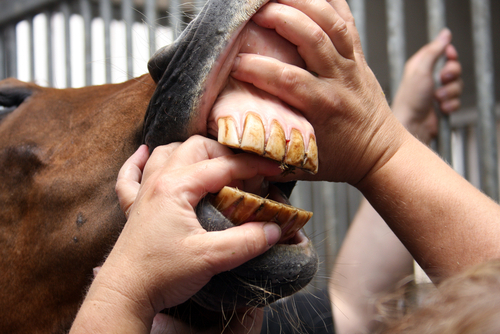 Once the floating is complete, the veterinarian or dentist will check to make sure the horse's canine teeth are not so long that they press into the opposing gums. If needed, they will be ground down or cut with a dental tool.& Some horses have wolf teeth, small premolars on the upper jaw. If present, they will usually be removed. Note that the speculum, the rasps, and any other tools are thoroughly disinfected with a bleach solution before and after floating the horse's teeth. 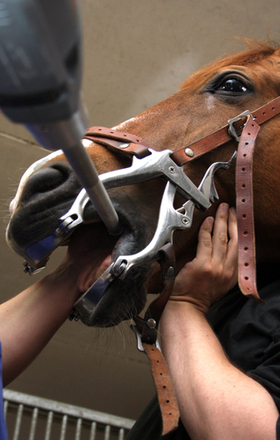 Equine dentist using specialized tools to quickly and painlessly float a horse's teeth. Horses that have had significant dental misalignment may have a very sore jaw after floating. The horse may have difficulty chewing and grinding food, so appropriate doses of phenobutezol should be administered and the diet should be supplemented with ground feed until the mouth stabilizes and pain subsides. If your horse's teeth are regularly floated and cared for, most dental problems will be avoided. Depending on your horse's diet, hardness of teeth, and jaw alignment, floating may be necessary on an annual basis, depending on what your veterinarian/dentist prescribes. 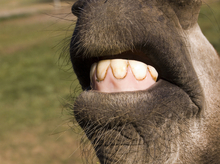 Talk to your equine dentist for instructions on how you can examine your horses teeth. Only a qualified dentist has the tools to examine the back molars that are difficult to check without specialized equipment. Make sure you check your horse's teeth on a regular basis. By noticing any changes in dental surfaces or eating habits, you can be proactive in making sure your horse gets needed dental care. By taking the time and making the effort, you will avoid complications that could affect your horse's health and vitality, as well as the enjoyment you get from your horse. One Word of Caution: Do not attempt to reach into your horse's mouth and feel the teeth unless you have been taught safe methods for doing so. The horse may bite, or you may shred your fingers on a sharp edge or point of a tooth.